Beware: The James River Scramble is not your typical Saturday stroll in the park. Along this 10k-ish course you may encounter roots, gravel, rough terrain, and low-hanging branches. Up for the challenge? You’ll get to experience firsthand some of RVA’s best outdoor gems. This is not a race for walkers. Course offers more trail and less pavement! 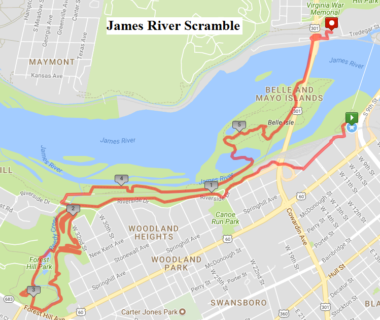 The James River Scramble will start on the south side of the river, just over the T. Tyler Potterfield Memorial Bridge. The James River Scramble utilizes wave starts in order to control volume on the trails. At the start of the race you will line up with the sign that matches your predicted pace per mile.